Manly Cake. There is a reason behind calling this cake such. It’s interesting to learn how certain desserts and flavors are gendered. 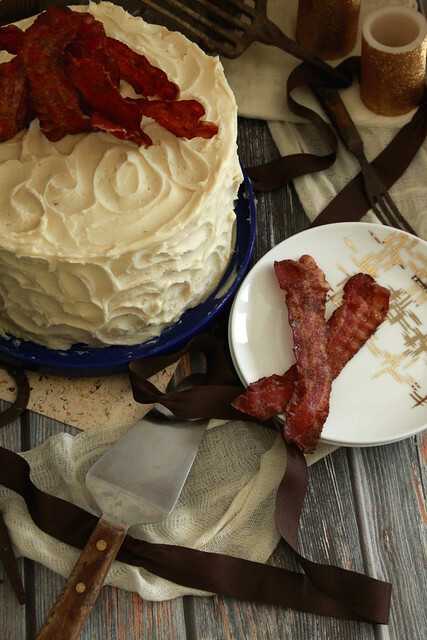 Layer cakes are no exception to this rule. 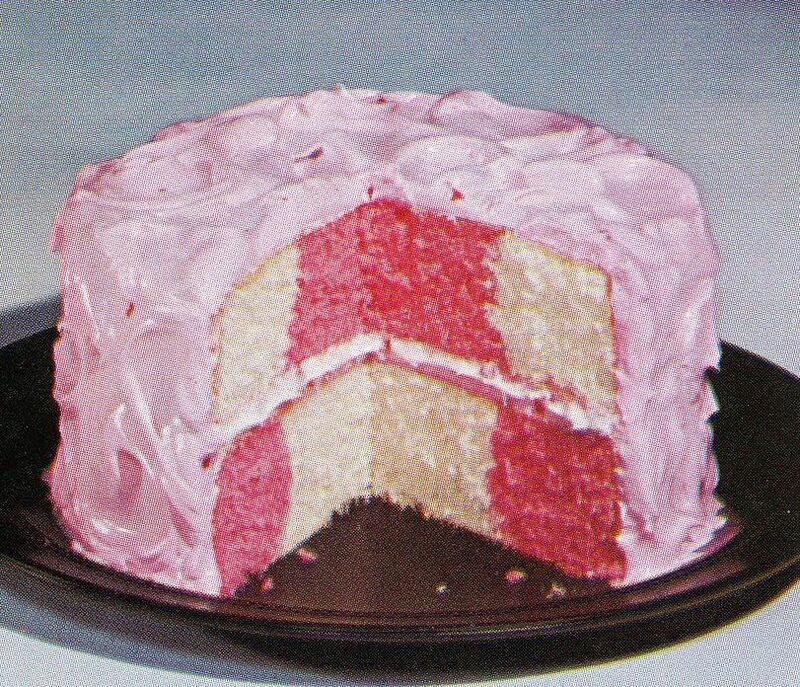 Looking through countless 20th century advertisements and cookbooks, you’re sure to find a light and fluffy pink frosted cake “perfect for lady lunches” and thick rich devils food cakes “for the man in the house.” I’m not using these quotations blindly, advertisements actually made such statements. Chocolate is not just a male cake flavor. In fact, companies like Baker’s and Betty Crocker (General Mills) advertised flavors, gearing the homemaker to cook it for the man. What is a Manly Cake you ask? 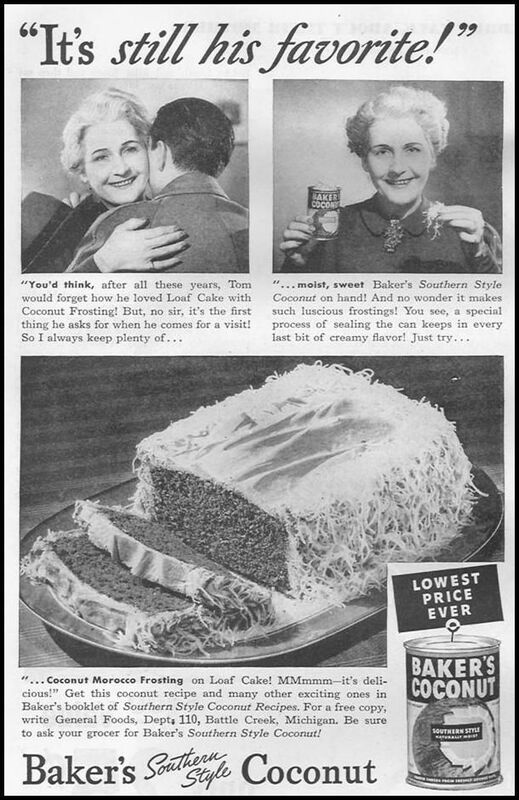 While the latter mentioned lady’s cake is light, white, and fluffy, man cakes of the mid-century were advertised as rich, thick, fudgey, and dense. I guess men had the ample appetite to wolf down thick slices of rich cake. There is a long standing assumption that rich cakes = menfolk food. That is it a performed ritualized tradition to make something rich and decadent for men. Unlike “lady” cakes that were categorized in recipe headers as ideal lady luncheon cakes. It’ not like we’re void of gendered foods in the modern time. The amount of pictures of women laughing with bowls of yogurt or salad is mind boggling. But this is just the narrow framework of print media advertisements of the mid-20th century, it is far from the reality. Women probably ate these cakes as well. At least I would, I dislike light and fluffy cakes. I’d rather eat a brownie fudge thick cake than an airy angel food cake any day of the week. It would be an easy route to simply make this Manly Cake chocolate. 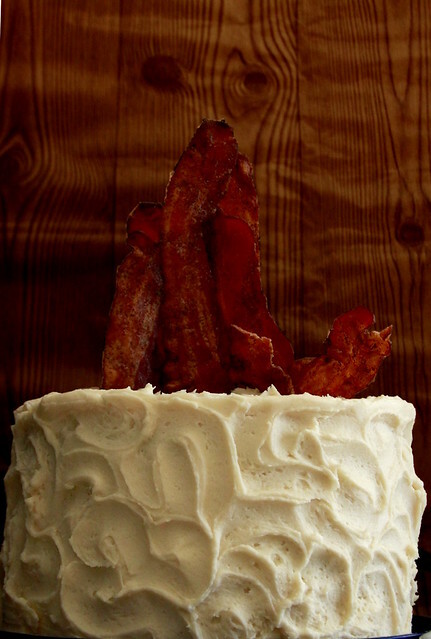 Instead I fused the present day male-associated food item of bacon and yesterday’s brown cake to make an ultimate manly cake. This Manly Cake has robust flavors at play, but each component doesn’t overpower one another. The brown sugar cake and brown sugar frostings have a warm and hefty texture with a rich mouth feel. The buttery walnuts compliment the natural nuttiness of brown sugar and add a nice textural component. Finally, the saltiness from the bacon tones down any potential excess sweetness. Preheat oven to 325 degrees. Spray three 8-inch cake pans with baking spray. Set aside. Using a stand mixer fitted with a paddle attachment, beat together butter and sugars until light and fluffy, about 3 minutes. Beat in eggs, one at a time, beating well after each addition. Add in vanilla. In a large bowl, whisk together flour and salt. In another bowl, combine sour cream and baking soda. Gradually add flour mixture to butter mixture in 3 additions, alternating with sour cream mixture in 2 additions, starting and ending with flour mixture.Scrape down the sides and bottom of the bowl as needed. Fold in the chopped walnuts. Divide batter between pans and smooth the batter with an off set spatula. Bake until golden and a toothpick inserted into centers comes out mostly clean, about 30 to 35 minutes. Let cakes cool in pans, about 15 minutes then invert cakes cool completely on a wire rack. In the meantime, make the frosting. Use an electric mixer fitted with a paddle attachment to cream together the butter and cream cheese until silky smooth, about 4 minutes. Scrape down the bowl as needed. Add the brown sugar and vanilla. Turn the speed to high and beat until fluffy, about 2 minutes. On the lowest speed, add the powdered sugar, ½ cup at a time, until frosting is thick, smooth and spread-able. Frost each layer with the brown sugar frosting and stack the next layer on top. Frost the cake with a final coat of frosting. Let the cake chill for a final 15 minutes.